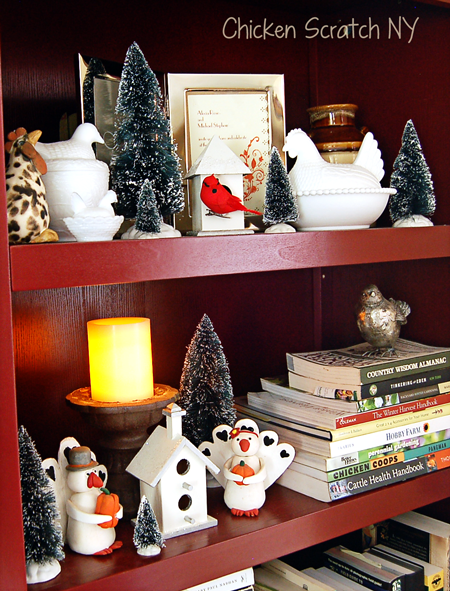 Do you rip down all your winter/Christmas/holiday decorations as soon as possible? I’ll admit that this year I did, I barely got 1/2 of my decorations up at all and the clutter from the tubs plus all the laundry (babies are so tiny but require SO MUCH laundry!) was driving me nuts. 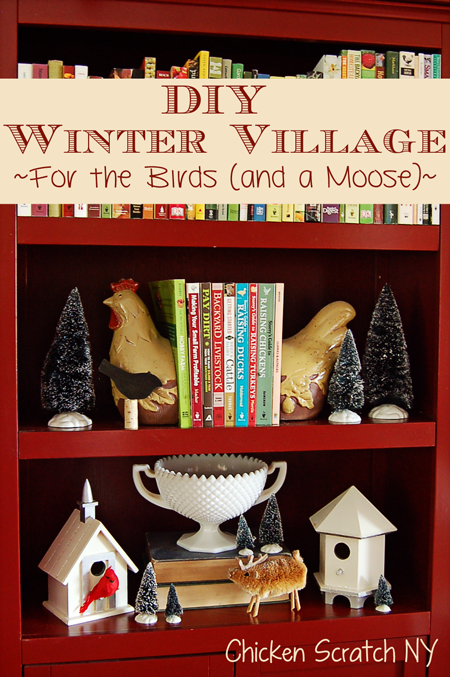 After it was all down (and in the basement) I realized how sad it made me and I had my husband bring one tub back up, so I could set up my DIY Winter Village. I love the (super expensive) ceramic winter villages that light up with a million houses but until I win the lottery it’s just not in the cards for me. So in true DIY fashion, I made my own. 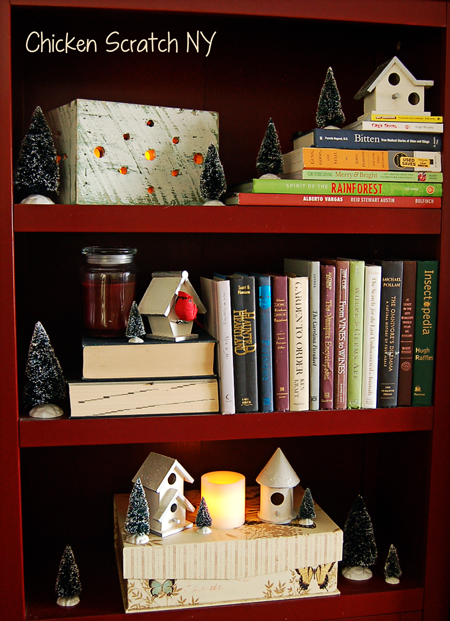 I usually keep it with the Christmas stuff but the bookshelves looked a little lonely and I wanted something on them that reflected the season. The houses are all from the wood aisle of either Joann’s or Michael’s. They come in bare wood and lots of different styles. The trees are from Michael’s, I buy the 21 pack of bottle brush trees by Lemax. The cardinals are from the floral aisle of Joann’s.The moose was an ornament until I clipped off the hanging loop; he was also from Michael’s. I painted the birdhouses are white with silver accents. I brushed on white glue and dusted the houses with chunky iridescent glitter. To set up the scene I took down all the non-essential decorations (I consider my Turkey Cake Toppers essential) leaving the books, boxes and my candle box. I places the houses first, starting with the larger two and filling in space with the smaller ones. Then I added the cardinals, I wanted one in each column and one in each row, it that makes sense, to keep your eye moving. This would obviously work for Christmas but I think it fills in the New Years to Valentines gap or even for the whole winter season (I’m not much for pink hearts haha). Great display to bring back up for a little winter cheer. i love this idea. simple and beautiful. i’d keep turkey cake toppers out all year if i had them. Those are adorable. Love them. That is so cute. We started taking down the Christmas decorations today and I am missing it already. This is a nice alternative. I love your little DIY village!! Very beautiful idea! I wish I had that lovely piece to display my animals in! Love this DIY! What a fabulous idea and very frugal too! This is adorable!! Looks like fun to make too. My Mom would love these because she loves bird houses! Very cute and so different! This is such a great idea! I love the fact that you were able to make the holidays last just a little bit longer in such a creative manner. What a very cute and economical decorating idea. I love Micheal’s. They always have the greatest items to help with your DIY jobs. Thanks for the great tip. Your hutch looks awesome. very pretty, I love the selection you chose. Very wintery and festive! So cute. I love all the trees. Adorable! I often find myself too busy to decorate my home, but I really need to make an effort for the kids. They love it so much when we have fun things out and about! I’m sure I’d never do as nice a job as you have, but wow, I really do love this idea. Looks so wonderful! Oh wow! that looks great. I can definitely see myself doing something like this for Christmas next year. Wow you did a great job with this! I am so not creative at all and when I see things like this I’m so amazed at the talents of my fellow bloggers. Thanks for sharing. What a neat display! The moose looks right at home with the birds. I like your diplays. It really is nice the way the seem to be perfectly placed where they are. 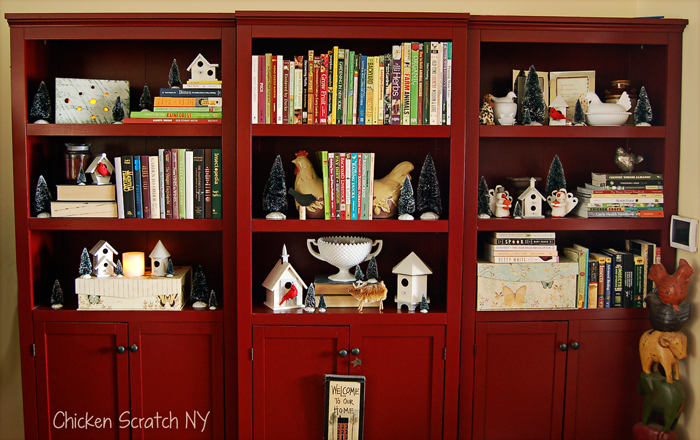 I LOVE the red shelves! Your decor looks fantastic against that red, I don’t think it would “pop” as much on a brown! Oh that is beautiful, you did a fantastic job! We hardly even decorated this year for Christmas but this is such a simple and cute way to decorate. My kids are still a little young for this though..all the decorations would end up on the floor as play toys!